Crochet a Doily from motifs. I think that a filet doily pattern is the easiest one to follow. Besides that it allows you to create any shape and size doily you wish. It looks simple, but it has clear lines and sensation of the home coziness and peace. 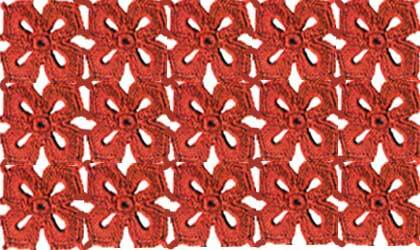 Some patterns for the filet crocheting doilies can be found at Filet Crochet Doilies page. You will find more of them added as I built this site. To make doilies in rounds doesn't mean that all of them have to have a round shape. Using crocheting in rounds technique you can make doilies of different geometrical shapes: round, rectangular, square, triangle, ans etc. It is crocheting in rounds technique which makes all of them "relatives". This kind of doilies we start to crochet from the small chain which creates a center of each doily. Doilies patterns are usually pretty intricate and it is not always easy to describe them in words. In most cases the graphic charts give you much better vision of a doily pattern. Crocheting instruction about reading patterns in rounds and doily patterns which use this technique can be found at Crochet in rounds page. There are no any restrictions for your creativity when you make doilies of motifs. Zillions of shapes, techniques, ways to connect motifs together, possibility to combine different materials allow you to create both unique art work or just a simple doily. Just don't be afraid to experiment. Here is my simple experiment. Each "red cross" motif was completed separately. The fabric was made by joining motifs together at the 12 points each. 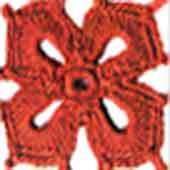 Description of this motif, possible ways to join different motifs together, and free crochet doily patterns made of motifs can be found at Crochet Motifs for Doilies page. The earliest known printed crochet pattern was published in the Dutch magazine "Penelope" in 1824. Hence, crocheting is not that old technique. What amazes me the most is that the process of creating more and more new patterns and crocheting techniques doesn't stop. Why? Is it just a fashion? Doesn't look like. Perhaps anything done by hand is "alive". Unlike machine-produced it has some special spirit and value. Filet crochet doilies: Free Filet Doilies Patterns. Crocheted Doily Pattern: Crocheting in rounds technique. Crochet a Doily: Crocheting doilies of motifs.